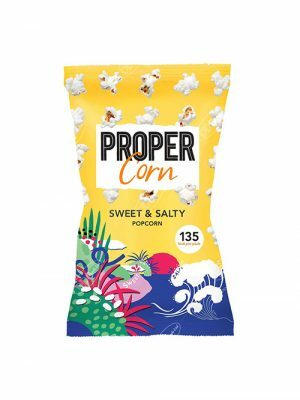 Propercorn sweet coconut & vanilla popcorn has been sprinkled with a blend of fresh coconut and Madagascan vanilla for the ultimate, uplifting snack. Propercorn Lightly Sea Salted Popcorn has been gently hand-popped. Brushed with a little British rapeseed oil and sprinkled with natural sea salt for that quintessential popcorn taste. Propercorn fiery Worcester sauce & sun-dried tomato popcorn are gently hand-popped. Propercorn created their own Worcester sauce and added a hint of fiery chilli for that mouth watering flavour. Propercorn Sweet & Salty Popcorn is dusted with a signature blend of sea salt and brown sugar for the perfect golden coating. The perfect guilt-free snack. Propercorn Sour Cream & Black Pepper Popcorn is gently popped and seasoned with a blend of sour cream and chives with a dollop of crème fraiche. 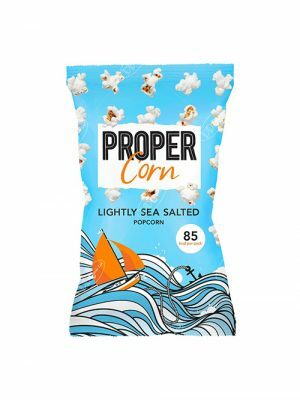 For added taste Propercorn included extra roasted onions for a greater depth of flavour.